The Ford F-Series lineup of trucks is extensive and ranges from consumer versions of the F-150 all the way up to commercial versions of the F-750. 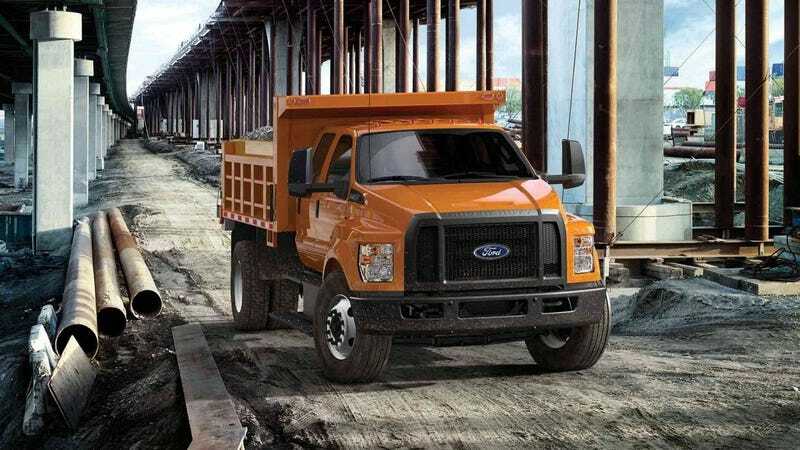 That truck and the F-650 are Class 6 vehicles that are called the Ford Medium Duty range. But they may not be around for long. Update: A Ford spokesman more vigorously denied this report after it was published. A document detailing the production schedule for the 2020 model year for Ford was recently posted on the Blue Oval Forums that shows the production timelines for the majority of their cars and trucks. One item that stuck out in the document was that the Medium Duty trucks are shown as N/A for 2020. You’d usually see that if Ford isn’t planning to build them. Similar N/A markings are shown for other Ford vehicles which we know are being cancelled such as the Taurus and Police Interceptor sedan. While Ford sells tens of thousands of the smaller trucks in the F-Series range every month, it only sold a little over 1,300 of the Medium Duty trucks in August as reported by Transport Topics. Their August sales don’t deviate too far from the past few months, as they are usually in the 1,100 to 1,900 range. Still, Ford may be looking to streamline some of its production and get rid of that range. The engine options for those trucks are Ford’s 6.7-liter diesel V8 as well as the 6.8-liter gasoline V10, which is likely going away soon due to emissions requirements. Ford is building a new 7.3-liter gasoline V8 dubbed “Godzilla 7X” that should replace the V10. That might give credence to a theory posted in that forum thread stating that Ford might be getting rid of the Medium Duty label and relaunching these trucks as an upper level of their Super Duty line once the new engine is ready. We asked Ford about its plans for the Medium Duty trucks and a representative only stated that they “remain important parts of the Ford lineup.” Hm. Ford has no intention of walking away from our medium-duty truck business. We are dedicated to our commercial customers and remain the only OEM offering a full line of commercial vehicles from Class 1 through Class 7. In fact, earlier this year we announced that we’re adding driver assist features to help improve confidence and reduce insurance costs across our commercial line-up including on future F-650 and F-750 medium duty trucks.